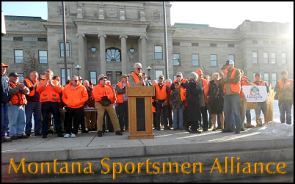 Billings—Today, the Montana Sportsmen Alliance endorsed farmer and United States Senator Jon Tester for his proven record of relentlessly defending our public lands and Montana’s outdoor heritage. Tester has always been a strong champion for Montana’s outdoor economy, which supports more than 70,000 jobs annually. And he has consistently opposed efforts to sell off or transfer federal public lands, has fought to reduce barriers to public access of land, and has worked to protect public land from development.